The Enigma machine doesn't support any special characters, so there's no support for spaces, and by default unsupported characters are removed and output is put into the traditional five-character groups. (You can turn this off by disabling "strict input".) In some messages you may see X used to represent space. Encrypting with Enigma is exactly the same as decrypting - if you copy the decrypted message back into the input box with the same recipe, you'll get the original ciphertext back. The plugboard exchanges pairs of letters, and is specified as a space-separated list of those pairs. For example, with the plugboard AB CD, A will be exchanged for B and vice versa, C for D, and so forth. Letters that aren't specified are not exchanged, but you can also specify, for example, AA to note that A is not exchanged. A letter cannot be exchanged more than once. In standard late-war German military operating practice, ten pairs were used. You can enter your own components, rather than using the standard ones. A rotor is an arbitrary mapping between letters - the rotor specification used here is the letters the rotor maps A through Z to, so for example with the rotor ESOVPZJAYQUIRHXLNFTGKDCMWB, A maps to E, B to S, and so forth. Each letter must appear exactly once. Additionally, rotors have a defined step point (the point or points in the rotor's rotation at which the neighbouring rotor is stepped) - these are specified using a < followed by the letters at which the step happens. Let's assume to start with that we know the rotors used were III, II, and IV, and reflector B, but that we know no other settings. Put the ciphertext in the input window and the Bombe operation in your recipe, and choose the correct rotors and reflector. We need one additional piece of information to attack the message: a "crib". This is a section of known plaintext for the message. If we know something about what the message is likely to contain, we can guess possible cribs. Let's try "Hello CyberChef" as a crib instead. If we enter HELLO CYBER CHEF, the operation will run and we'll be presented with some information about the run, followed by a list of stops. You can see this here. Here you'll notice that it says Bombe run on menu with 0 loops (2+ desirable)., and there are a large number of stops listed. The menu is built from the crib you've entered, and is a web linking ciphertext and plaintext letters. (If you're maths inclined, this is a graph where letters - plain or ciphertext - are nodes and states of the Enigma machine are edges.) The machine performs better on menus which have loops in them - a letter maps to another to another and eventually returns to the first - and additionally on longer menus. However, menus that are too long risk failing because the Bombe doesn't simulate the middle rotor stepping, and the longer the menu the more likely this is to have happened. Getting a good menu is a mixture of art and luck, and you may have to try a number of possible cribs before you get one that will produce useful results. You can see this here. You will immediately notice that the output is not the same as the decryption preview from the Bombe operation! Only the first three characters - HEL - decrypt correctly. This is because the middle rotor stepping was ignored by the Bombe. You can correct this by adjusting the ring position and initial value on the right-hand rotor in sync. They are currently A and G respectively. Advance both by one to B and H, and you'll find that now only the first two characters decrypt correctly. which is the best we can get with only adjustments to the first rotor. You now need to adjust the second rotor. Here, you'll find that anything from D and F to Z and B gives the correct decryption, for example here. It's not possible to determine the exact original settings from only this message. In practice, for the real Enigma and real Bombe, this step was achieved via methods that exploited the Enigma network operating procedures, but this is beyond the scope of this document. What if I don't know the rotors? You'll need the "Multiple Bombe" operation for this. You can define a set of rotors to choose from - the standard WW2 German military Enigma configurations are provided or you can define your own - and it'll run the Bombe against every possible combination. This will take up to a few hours for an attack against every possible configuration of the four-rotor Naval Enigma! You should run a single Bombe first to make sure your menu is good before attempting a multi-Bombe run. What if I know my crib is right, but I still don't get any stops? The bulk of the conversions are implemented in "rotors", which are just an arbitrary mapping from the letters A-Z to the same letters in a different order. Additionally, to enforce the symmetry, a reflector is used, which is a symmetric paired mapping of letters (that is, if a given reflector maps X to Y, the converse is also true). These are combined such that a letter is mapped through three different rotors, the reflector, and then back through the same three rotors in reverse. The Bombe is a mechanism for efficiently testing and discarding possible rotor positions, given some ciphertext and known plaintext. It exploits the symmetry of Enigma and the reciprocal (pairwise) nature of the plugboard to do this regardless of the plugboard settings. Effectively, the machine makes a series of guesses about the rotor positions and plugboard settings and for each guess it checks to see if there are any contradictions (e.g. if it finds that, with its guessed settings, the letter A would need to be connected to both B and C on the plugboard, that's impossible, and these settings cannot be right). This is implemented via careful connection of electrical wires through a group of simulated Enigma machines. A full explanation of the Bombe's operation is beyond the scope of this document - you can read the source code, and the authors also recommend Graham Ellsbury's Bombe explanation, which is very clearly diagrammed. Enigma rotor and reflector settings are from GCHQ's documentation of known Enigma wirings. We currently simulate all basic versions of the German Service Enigma; most other versions should be possible by manually entering the rotor wirings. There are a few models of Enigma, or attachments for the Service Enigma, which we don't currently simulate. The operation was tested against some of GCHQ's working examples of Enigma machines. Output should be letter-for-letter identical to a real German Service Enigma. Note that some Enigma models used numbered rather than lettered rotors - we've chosen to stick with the easier-to-use lettered rotors. The output of the real Bombe is optimised for manual verification using the checking machine, and additionally has some quirks (the rotor wirings are rotated by, depending on the rotor, between one and three steps compared to the Enigma rotors). Therefore, the output given is the ring position, and a correction depending on the rotor needs to be applied to the initial value, setting it to W for rotor V, X for rotor IV, and Y for all other rotors. 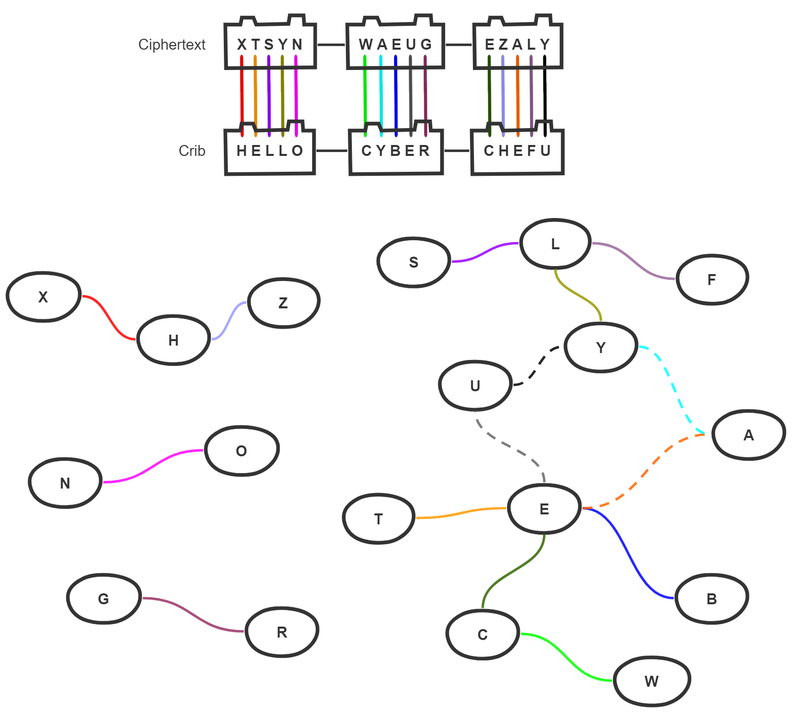 We felt that this would require too much explanation in CyberChef, so the output of CyberChef's Bombe operation is the initial value for each rotor, with the ring positions set to A, required to decrypt the ciphertext starting at the beginning of the crib. The actual stops are the same. This would not have caused problems at Bletchley Park, as operators working with the Bombe would never have dealt with a real or simulated Enigma, and vice versa. We have tried to remain fairly faithful to the implementation of the real Bombe, rather than a from-scratch implementation of the underlying attack. There is one small deviation from "correct" behaviour: the real Bombe spins the slow rotor on a real Enigma fastest. We instead spin the fast rotor on an Enigma fastest. This means that all the other rotors in the entire Bombe are in the same state for the 26 steps of the fast rotor and then step forward: this means we can compute the 13 possible routes through the lower two/three rotors and reflector (symmetry means there are only 13 routes) once every 26 ticks and then save them. This does not affect where the machine stops, but it does affect the order in which those stops are generated. The fast rotors repeat each others' states: in the 26 steps of the fast rotor between steps of the middle rotor, each of the scramblers in the complete Bombe will occupy each state once. This means we can once again store each state when we hit them and reuse them when the other scramblers rotate through the same states. If you have a large attack to run on a multiprocessor system - for example, the complete M4 Naval Enigma, which features 1344 possible choices of rotor and reflector configuration, each of which takes about 5 seconds - you can open multiple CyberChef tabs and have each run a subset of the work. For example, on a system with four or more processors, open four tabs with identical Multiple Bombe recipes, and set each tab to a different combination of 4th rotor and reflector (as there are two options for each). Leave the full set of eight primary rotors in each tab. This should complete the entire run in about half an hour on a sufficiently powerful system.